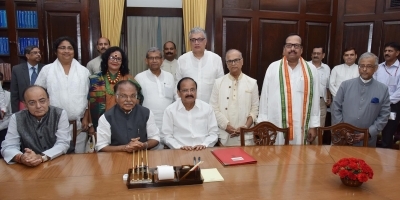 New Delhi, Aug 29 (IANS) Six newly-elected Rajya Sabha members from West Bengal, five from Trinamool Congress and one from Congress, were sworn-in on Tuesday. 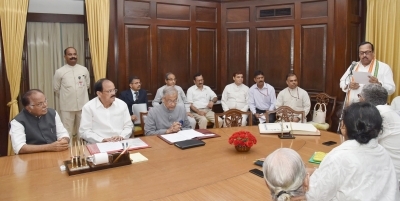 Vice President M. Venkaiah Naidu, who is the upper house’s ex-officio Chairman administered the oath to the newly-elected Members in his chamber in Parliament House. The new members are Pradeep Bhattacharya of the Congress, Derek O’Brien, Manas Ranjan Bhunia, Sukhendu Shekhar Raoy, Shanta Chhetri and Dola Sen, all of the Trinamool. All of them took oath in Bangla. Of these, Bhunia and Chhetri have been elected to the upper house of Parliament for the first time, while the rest were re-elected. Rajya Sabha Deputy Chairman P.J. Kurien, Union Minister and Leader of the House in Rajya Sabha Arun Jaitley and Minister of State for Parliamentary Affairs Mukhtar Abbas Naqvi were also present on the occasion.